Stay cool in the shade and get a free quote for retractable awnings from Early Times. We offer Chicagoland with the highest quality awnings. Have you ever wanted to sit on your patio or deck but it was too hot? The sun is beating down on you and you’re sure to get a sunburn. Retractable awnings from Early Times prevent the sun and heat from roasting you while you enjoy the outside. Our Sunsetter® retractable awnings are from SunSetter and made of a durable fabric that won’t rip or tear in the elements. They’re the perfect addition to any outdoor living space as they shield you from the sun while still allowing you to enjoy fresh air. Much like other awnings, retractable awnings extend beyond the façade of your home and hang above your patio or deck to shield you from the sun. However, there’s one major difference that helps separate them from the rest. Retractable awnings can retract back into the façade of your home when you’re not outside. It improves the look of your home’s exterior while keeping your awning safe from the elements. So how do you open your retractable awning? The most popular option is the motorized retractable awning. They come with a remote that allows you to open and close your awning with the push of a button. You even have the option to open your awning as far or as little as you’d like – you have complete control. There’s also the less expensive manual retractable awning model. Rather than having a motor that opens the awning for you with the push of a button, you have to manually open it with a hand crank. You’re still able to have your awning open and ready to go in a matter of minutes. Both styles are also extremely easy to install. They come fully assembled and only need a mounting height of 7 feet 6 inches. Plus, they can be installed on any surface including brick, siding and stucco. Whether you’re looking for a patio awning, deck awning or something else, Early Times has you covered. You already know that they allow you to sit outside on days when the sun is shining its brightest but how much of a difference do they make? Believe it or not, an awning could cool down your deck or patio as much as 20° – that’s pretty significant. Plus, you’ll be blocking 99% of UV ray from reaching your patio. No more worrying about getting sunburned with a SunSetter awning. A little rain won’t keep you inside with a SunSetter retractable awning. 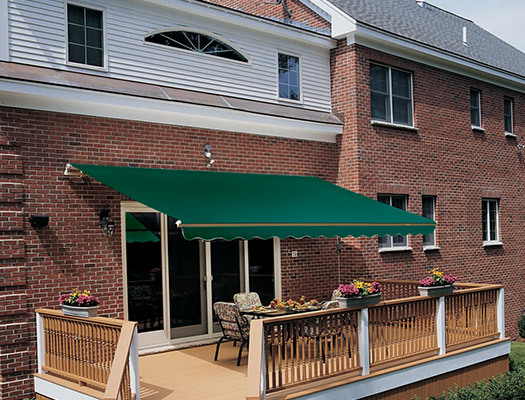 The awning pulls out in just seconds and you’re ready to enjoy the outside despite the weather. It’ll also keep your deck and patio furniture dry during rain storms if you decide to keep it open. If you don’t want to keep your retractable awning out 24/7, you don’t have to. One of their biggest benefits is that they can be retracted back into your home. When you want to use the awning again, just push a button or crank it out. 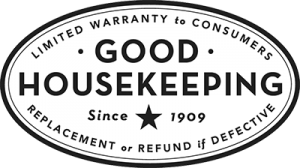 Our awnings come with a Good Housekeeping Seal of Approval and the Skin Cancer Foundation Recommendation. Those are pretty high accolades for our awnings that not many companies can’t boast. Our retractable awnings come in many different styles and sizes. There are motorized awnings, manual awnings and oasis awnings. Oasis awnings are free-standing awnings that create an oasis of shade in the middle of your backyard. There are also many fabric colors to choose from. There’s sure to be one that complements the color of your home’s exterior. You’re bound to find exactly what you need at Early Times Home Solutions. If you’re looking for a retractable awning, Early times is the place to go. We sell many different styles of SunSetter retractable awnings. We offer both motorized and manual styles depending on what you’re looking for. There are also many different sizes available. No matter how large or long your patio or deck is, we’ll find the perfect retractable awning for you. Choose from a multitude of different colors and patterns for your Sunsetter retractable awning. We make sure that you’re able to get the awning of your dreams with Early Times Home Solutions. Installation couldn’t be easier! With the awning itself coming pre-assembled, all you need to do is mount it where you’d like it. Then just sit back, relax and enjoy your newly shaded deck or patio.